The water from which impurities such as salts, heavy metals and other contaminants have been removed through distillation is called distilled water. Water Distiller is a container, used for removing these impurities by boiling the water and then condensing the steam into clean and pure water. GPC Medical Limited, internationally reputed manufacturers & exporters of quality hospital equipment & devices, in the range of Sterilization Equipment, include superior quality Water Distillers in different sizes/capacities for homes, hospitals, laboratories, educational institutions and other establishments. The GPC Distillers are produced from high grade raw material and premium quality components. Subjected to various quality tests, these Distillers are fast, corrosion resistant, sturdy, durable, economical and reliable. The quality conscious clients, in different countries, highly acclaim our Water Distillers for their hassle free and excellent performance. In addition to our standard models, we provide customised solutions to the satisfaction of all concerned. 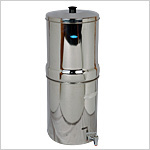 Send Your Buy Requirement For "Water Distillers" AND Get Quote Quickly.